I'm not one for Halloween. I don't get into it; I do it for the children. 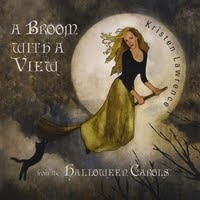 But, when I was offered to review the A Broom With a View (a Halloween Carols CD) by Kristen Lawrence, I was interested because Kristen writes and performs historically-based Halloween music in the format of Christmas carols. I put this CD in the other day while my children were in the car and at first they were complaining, saying that the songs didn't sound like Halloween songs. I explained that the artist sings them like Christmas Carols, and to be quiet and listen to the words, then all was quiet. Except for the sound of Kristen's beautiful voice. A Broom with a View is available to buy at DFJams Store and cdbaby, soon to be on iTunes and Amazon.com. If you don't want to buy it, you can win a copy here! To enter, tell me what you think you would enjoy most about this CD. This giveaway is open to US & Canadian residents, and will end on October 27th at midnight EST. Winners will be announced in a post here at A Simple Kinda Life and will be emailed. Winners will have 48 hours to claim their prize or a new winner will be chosen. This post was written for Family Review Network as part of a program from Halloween Carols, who provided the program for review and giveaway. My kids are really getting into Halloween this year! I think they would really love this CD as they sing Christmas songs all the time too!! My hubby and I were married on H'ween. This album sounds like something I would love to listen to and new music for our anniversary would be great! Halloween songs!! So different ,I would love them because it so different.